Donate Now to The Most Dangerous Year! In early 2016, The Human Rights Campaign published a report identifying 2016 as the most dangerous year for transgender Americans. The Most Dangerous Year is about a small group of Washington State families caught in the middle of the nation’s “bathroom wars”. 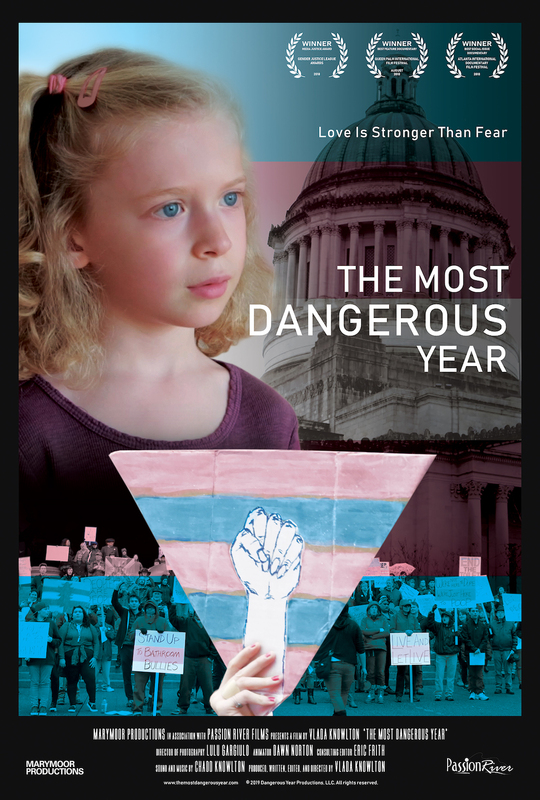 Vlada Knowlton, a Seattle area filmmaker and a parent of a transgender child, takes us to the front lines of this heart-wrenching political battle. The story begins in January, when six discriminatory anti-transgender bills are introduced into the Washington State Legislature. This launches a year-long struggle in which the central group of parents, who had never been political activists in the past, along with a state-wide coalition of lawmakers and civil rights organizations, attempt to fight a dark movement of fear, hate, and ignorance. From the tension-filled Senate hearings to the passionate Olympia protest rallies; from the “Washington Won’t Discriminate” celebrations of diversity to the “Just Want Privacy” press events heralding the intent of the anti-transgender (I-1515) ballot initiative…Knowlton takes us on the journey of Washington State’s modern-day civil rights battle, as well as her own struggle to protect her 5-year-old transgender daughter from laws inspired by bigotry and fear. The Most Dangerous Year is Knowlton’s second feature documentary.